The Hospitality Sales & Marketing Association International (HSMAI) will recognize SeaCrest OceanFront Hotel of Pismo Beach, CA with a Bronze Adrian Award for digital marketing excellence for its campaign, Life Happens™, in the 57th annual Adrian Awards, the largest and most prestigious global travel marketing competition. This year, we saw outstanding entries in all categories and in particular an ability to implement integrated campaigns that garnered powerful results across multiple channels. This year’s contest attracted more than 1,200 entries from around the world, with entries judged by top executives from all sectors of the industry. 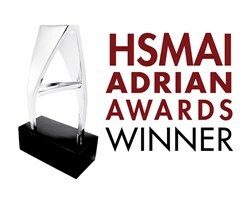 On Feb. 24, 2014, HSMAI will pay tribute to the SeaCrest and its Life Happens™ campaign during the annual HSMAI Adrian Awards Gala, a black-tie affair attended by more than 1,000 hospitality, travel and tourism marketing executives at the New York Marriott Marquis. In addition to commending SeaCrest’s award-winning work, the gala and dinner reception honors lifetime achievement in travel / hospitality marketing, as well as the “Top 25 Most Extraordinary Minds in Sales and Marketing.” All winning entries will be accessible in the Adrian Awards Winners Gallery online following the gala at http://www.adrianawards.com. Visit http://www.AdrianAwards.com for more information on the event and competition. Located on the Pismo Bluffs with direct beach access, the iconic Pismo Beach SeaCrest OceanFront Hotel has provided over 50 years of superior service to its guests. With its newly designed retro-chic look and 21st century amenities, the hotel combines classic tradition with all the features today’s discriminating guests demand. Learn more at http://www.seacrestpismo.com. Join SeaCrest and other local industry professionals as they host their first professional networking mixer as the founders of the Central Coast Chapter of HSMAI. Marco Reginelli, Account Executive & Head of Travel at Google will present “Mobile Marketing on the Central Coast.” Then, you will have the chance to discover the benefits of joining HSMAI while enjoying local Central Coast wines. This free event takes place on Thursday, February 27th, 2014 from 5:00 pm to 7:00 pm at the SeaCrest OceanFront Hotel in Pismo Beach, CA.RSVP today to marketing(at)seacrestpismo(dot)com or call (805) 773-4628.